A website for a new local nursery school. This was a freelance project produced for Lightwater Nursery School, a nursery school located in Lightwater, Surrey. Lightwater Nursery School was just about to open its doors, as it was replacing an existing pre-school on the same site. 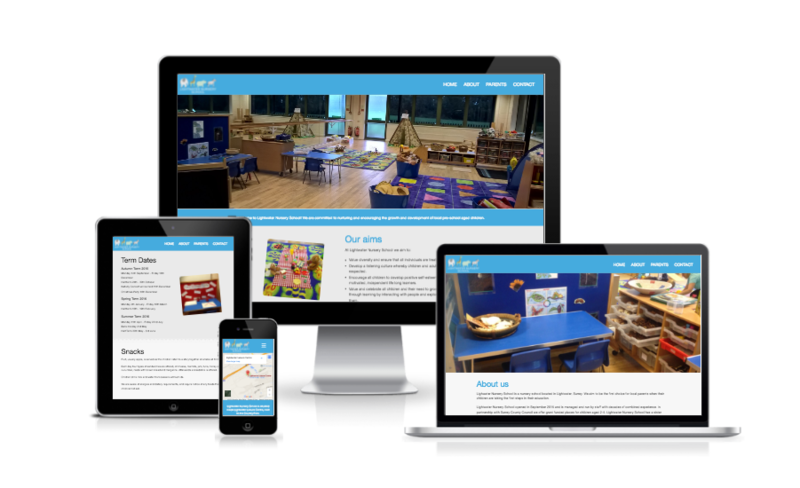 I was tasked with designing and developing a website to showcase the aims of Lightwater Nursery School, as well as to provide important information to parents. Working on the project on a freelance basis, I designed and developed the website myself, using HTML, CSS and the Bootstrap framework. The site was designed to fit with the existing branding of Lightwater Nursery School, and serves to inform parents about information such as term dates. The site also uses integrated Google Maps to help find the nursery.